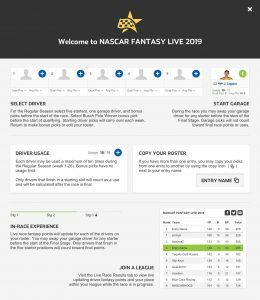 NASCAR Fantasy Live is back for the 2019 season with a few tweaks from last year’s game. Players can sign up right now to be ready to go for the start of the season – the 2019 Daytona 500 on Feb. 17. Pro tip: One bonus pick must be set by Feb. 10 for qualifying — more on that below! Accessing the game to set your roster can be done by logging into your account and going to the Fantasy page (NASCAR.com/Fantasy). You also can access the game by opening the NASCAR Mobile App, logging into your account and clicking the Fantasy icon on the bottom of the app. Mobile users can also opt in to receive fantasy alerts to help you stay on top of your roster each week. As you read, listen in to our first episode of the Fantasy Fastlane podcast. What is the roster composition? The roster will consist of five starting drivers as well as a garage driver in reserve (more below on that). Driver and garage selections lock five minutes before the race start time. How does the garage driver work? Players can substitute their one garage driver for any starting driver up until the start of the Final Stage. Once the Final Stage starts, there are no more switches allowed. So which drivers end up scoring points? The drivers ending the race in your main roster will comprise the drivers that make up your total score. These are also the drivers who will be counted as being used for that particular race. A driver that ends the race in the garage would not count as being used nor would their results count toward your score. Are there any limits to how much a driver can be used? Yes, players can only use a particular driver up to 10 times over the 26 regular-season races. A usage tracker will be displayed on your roster screen, showing the number of remaining driver uses you have during the season. The scoring will reflect the NASCAR’s scoring system. For example, if Kyle Larson wins Stage 1 & Stage 2 and wins the race, he will earn players 60 fantasy points for that particular race just as he would earn 60 points for himself in the season standings. Drivers running in the top 10 at the end of Stage 1 and Stage 2 receive points, starting with 10 points for first, nine for second, etc. The race winner receives 40 points, while second-place receives 35 points, third receives 34 points and all the way down to 1 point for drivers that finish 36th through 40th. Will the new competition model have an impact on scoring? The results won’t be official until the at-track post-race inspection is complete — that should be about 90-120 minutes after the race. Since scoring mirrors that of the drivers in real life, that means that if a driver in your lineup fails post-race inspection, your lineup would be subject to the same impact as the driver is — last-place points. On the positive side, if you didn’t have a penalized driver in your lineup, the rest of the finishing order moves up meaning you could potentially pick up points. What is new for the game in 2019? Two main things are new this year. The race winner bonus pick is now only worth 10 extra points. Also, your previous week’s roster will be carried over to the next race – meaning it is on you, the owner, to make swaps ahead of the upcoming race to avoid burning uses you may want to reserve for future weeks. Are there any additional bonus picks? Yes, players can make bonus picks for the pole winner, Stage 1 winner, Stage 2 winner, race winner and manufacturer winner. The pole winner bonus pick selection will lock approximately five minutes before the start time of qualifying; Daytona qualifying picks must be set before Feb. 10’s pole qualifying day that is scheduled to begin at 12:10 p.m. ET. All other bonus picks lock five minutes before the race start time. Bonus picks DO NOT count against driver usage. What is the value of each bonus pick? Will my leagues and teams from last year be available? Yes, any team or league that was active at the end of last season will be available once you log in. Can I copy my roster for multiple leagues? A new feature for 2019 allows you to copy your picks from one entry to another by using the copy icon located next to your entry name. How long will the Fantasy Live regular-season game last? The game will cover the 26 regular-season races — from the Daytona 500 on Feb. 17 to the Brickyard 400 on Sept. 8. What happens for the playoffs? Fantasy Live will continue during the playoffs with an additional bonus pick (the champion), unlimited uses for drivers and one less driver in your roster. You can also expect to have to utilize playoff and non-playoff drivers in the game.